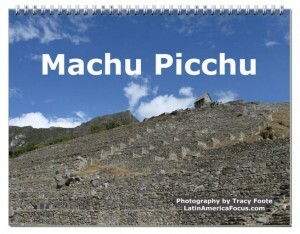 Our Machu Picchu calendar is offered in several sizes and even allows customization. Personalize it to create a special gift for someone’s wall. Inside are unique photos of ruins from many different angles, including views from Huayna Picchu mountain and the Sun Gate entrance (about an hours walk a way). Photographer, Tracy Foote’s photos begin in January with the Peru Rail train ride into Machu Picchu Pueblo (formerly known as Aguas Calientes). 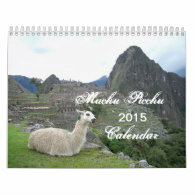 The calendar months continue through classic views of the ruins, a close up view from Huayna Picchu, unusual nature foliage, a llama, and more. Every month of the year, you can experience the mystical feel of the cloud rain forest surrounding Machu Picchu Peru. If your travels to Peru only allowed you to train in and train out of Auguas Calientes on the same day, perhaps these photographs will inspire you to make a future visit to Peru. This is a wall calendar with a spiral middle, so the photographs are on top with the calendar dates on the bottom.